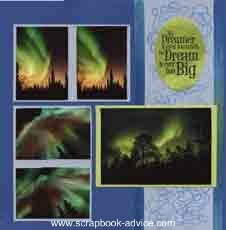 My Alaska Scrapbook is actually my way to dream. I have never actually seen the Northern Lights, but I did become the recipient of some photos of the Aurora Borealis that I just had to Scrap. 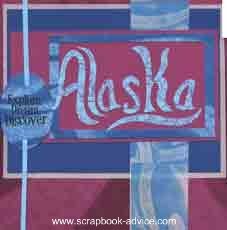 Hopefully, by Scrapbooking Alaska, this will point me in the right direction and help get me there. 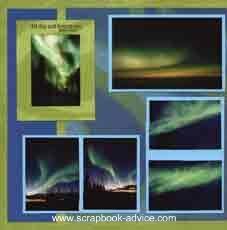 While I still have not made it to Alaska to see the Aurora Borealis, I have just read a news report that they have been visible even in the southern United States as recently as October 26, 2011. So check out the night sky next time you have a chance and you might just get to see them in person. 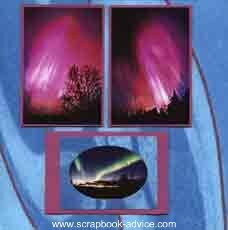 According to the National Weather Service (NWS), the aurora is typically viewed only at high latitudes near the earth's poles where the magnetic field is the strongest. They are a mixture of particles from the sun's solar wind as they interact with gases in the magnetic field in the Earth's upper atmosphere. 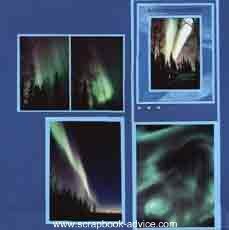 When the Aurora appears near the south pole they are called Aurora Australis. Back to the photos of the Northern Lights. I had a lot of them and I just couldn't find the right paper as I couldn't seem to visualize mixing the colors in the photos with the same colors of papers. Although the photos were spectacular, I felt like there were just too many colors to find the right papers and I just did not want to use a plain white background. So I waited a while and it wasn't too long after that when I received a kit of Club Scrap paper titled "Stratosphere" in April of 2007. 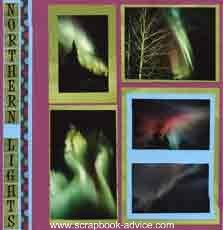 This kit was perfect for my Alaska & Northern Lights photos! Well,I did have a lot of photos and there were nearly all the same color combinations. As part of Club Scrap's monthly kit, they also have available cutting templates for using their paper and embellishments to make what I call "Naked Layouts" - layouts without the photos! 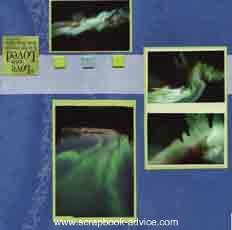 Club Scrap calls it ALSB - Assembly Line ScrapBooking. I love their idea and it's a great way to get wonderful layouts without investing a whole lot of time or creative energy. An interesting concept. I actually get to put everything together and do the fun part without having to be so creative all the time. I tend to burn out on creativity after doing a lot of scrapping - I begin to wear out my ideas after about 10 pages or so and this process fit's the bill quite nicely in this case. 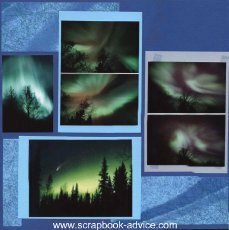 So my process for putting together what turned out to be my Alaska Scrapbook was a great test for this Assembly Line process and my stash of Northern Lights Aurora Borealis Photos. 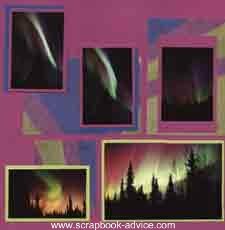 After I finished up the Scrapbooking Alaska's Northern Lights layouts, I liked them so much, I ordered some extra large Colossal size paper from Club Scrap in the same colors as the layouts, and the fixings for a scrapbook and actually made the entire book to go around the layouts. 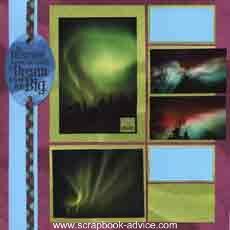 Alaska Scrapbook Layouts Featuring Northern Lights or Aurora Borealis. 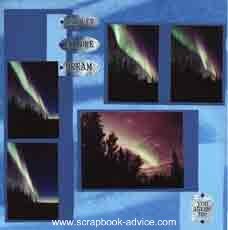 This first set of Alaska Scrapbook Layouts used the letter stickers down the left page for a border to spell out the name "Northern Lights". The ribbon that came with the Embellishment Kit was used down the sides of both pages to create a border effect. The Tag which says "No Dreamer is ever too small, no Dream is ever to Big." What a great tag to display my feelings about wanting to see the beautiful State of Alaska! These two layouts above used a technique with "Red Line Tape" or "Extra Sticky Tape" which is very, very sticky. The tape was applied along the swirl shape on the background paper and then I applied Raspberry colored micro-beads to the tape. 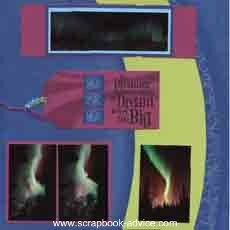 These beads and tape were also supplied with the Embellishment Kit and the instructions for doing this on the layout were provided with the Assembly Line instructions, so you not only get a great set of layouts, you also get all the tips on how to do the embellishments. The layouts on these two page used no additional embellishments, so I decided to double matte the three photos on the right side. Since I had a number of smaller photos that were similar, I matted them together on one large matte. These photos had a lot of lime green tones combined with a lot of the pink so I mixed the pink and lime for the background papers. Several of these photos are double matted. The first mattes are made of patterned paper with a solid matte directly under the photo. This helps to separate the photo from the background design and tone down the activity for the eye. Also on these pages, several of the photos are offset from the first mattes. You can get creative and you don't always have to place your photo within the matte boxes. Scrap outside of the box! Here again, very little embellishment. The layout on the left again uses the technique of double photos on one matte. The layout on the right uses not only a double matting on the one photo, but a photo frame from the Embellishment kit, and 3 blue brads on the bottom left of the photo. These two layouts above get away from the square nature of layouts and cover the lime background paper with pieces of the patterned paper cut on the curve and taped to the lime green. Tags are used on these layouts and were pre-printed from the Embellishment Kit, as was the ribbon attached to the hole in each tag. 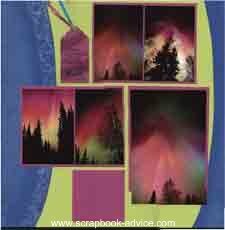 These last three layouts for the Alaska Scrapbook, both above and below use printed tag embellishments, and both round and square brads as embellishments alone or to attach the tags. 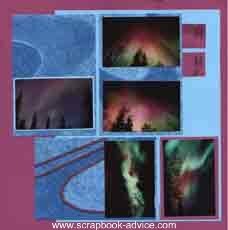 I hope you enjoyed getting to look at these Alaska Scrapbook Layouts. I had fun doing them and the entire process, using the Assembly Line process from Club Scrap, took only 3 hours! I actually did 24 total layouts for my Alaska Scrapbook and I believe that's a record breaker for speed and good quality layouts. Normally, I do not use all of my Assembly Line Scrapbook layouts from a kit to fill an entire scrapbook, even if it is all the same theme. 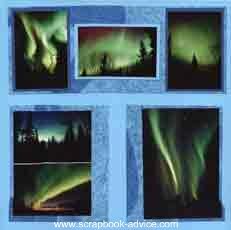 I usually end up with pairs of layouts from different kits, but this Alaska Scrapbook just worked out that way. 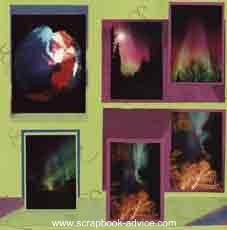 I also have another full themed scrapbook done with Assembly Line Scrapbooking using another Club Scrap kit at the Birds of Prey Scrapbook.